in North Eastern Railway Recruitment are 745 posts. Notification has released on 30-11-2018. Interested/ Efficient candidates can apply for this Fitter, Turner, Welder, Machinist and Carpenter ITI Apprentices Jobs through offline using the NER official website www.ner.indianrailways.gov.in. Application forms with all attested copies, Signature, Photograph should be reach to the below mentioned address before 29-12-2018. Candidates will be selected for NER ITI Apprentices Vacancies based on their merit in Matriculation and ITI Examination. The Organization will take average marks from 10th class examination and ITI examination to shortlist candidates. 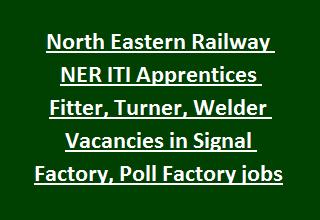 For more information regarding North Eastern Railway ITI Trade Apprentices in Mechanical Workshop, Poll Factory Recruitment Age, Relaxations, Pay Scale, Selection Process, Qualifications, Application Procedure details are given below. Available vacancies in North Eastern Railway Recruitment are is 745 posts. Qualifications for the post Apprentices is 10th class pass with minimum 50% marks and ITI in relevant trade approved by NCVT. Please see the NER Notification for more details. Age of the candidate should be below 24 years and above 15 years. Age relaxations applicable as per NER Govt Instructions. Salary for Apprentices Vacancies will be offered as per NER Govt instructions. Candidates will be selected for ITI Apprentices in NER Recruitment is based on their merit in Matriculation and ITI Examination. See the Northeastern Railways Notification for detailed Selection process. Go through the NER notification for Application fee related information. Eligible/ Interested candidates have to check the North Eastern Railway official website www.ner.indianrailways.gov.in. Download the application in respective trade. Read the Advertisement link carefully and start filling the details in application form. Last date for sending application is 29-12-2018.